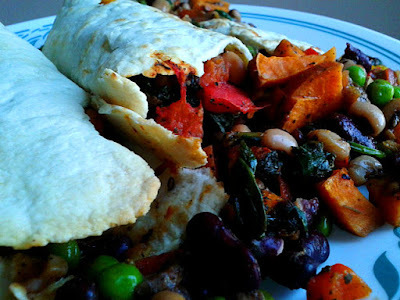 One of me favourite foods pre-veganising were fajitas and enchiladas. 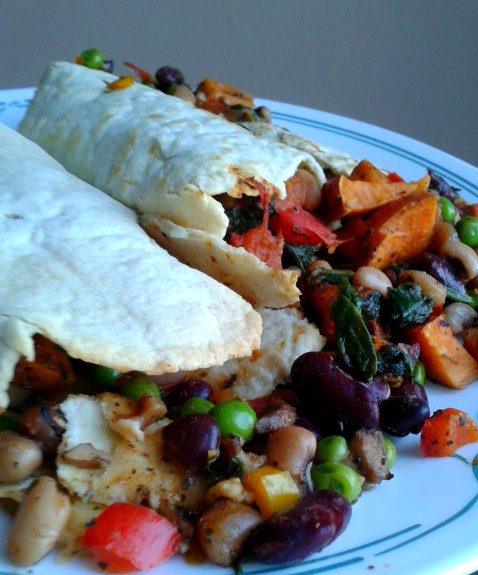 This was one of the comfort foods I had yet to remake... until last month. Why the name? 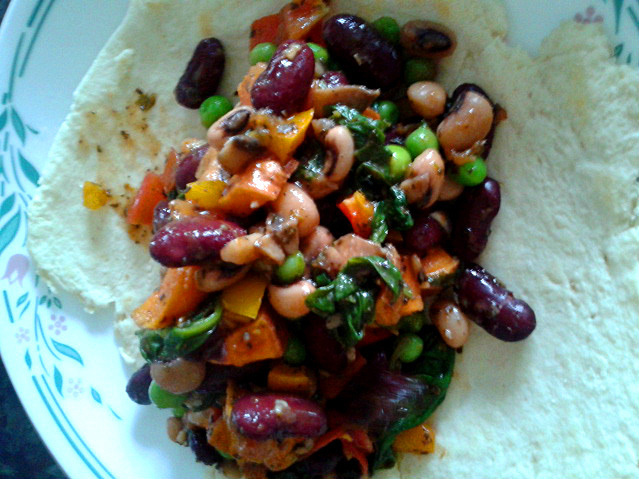 Well, every time I make this, I end up with waay more filling than can be contained in the tortillas...not complaining! 1. In a large bowl, mix together the Flour, Baking Powder, Salt. 3. 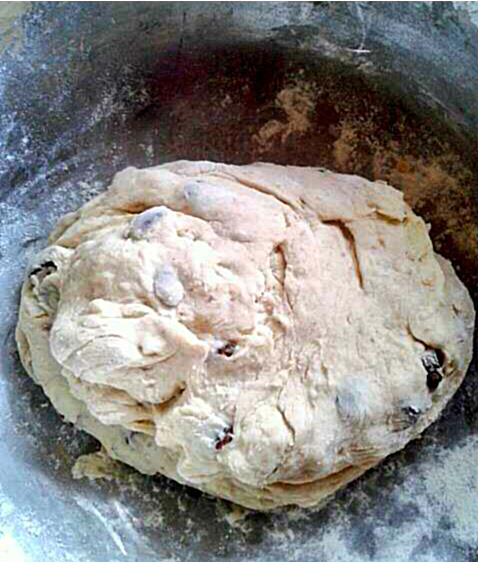 Add water a little at a time to form a dough, then cover the dough with clingfilm and put to the side. 4. Wash and chop your Sweet Potato into small cubes. Steam them for about 5 minutes or place them in a pot of water over the stove until they are soft. 5. 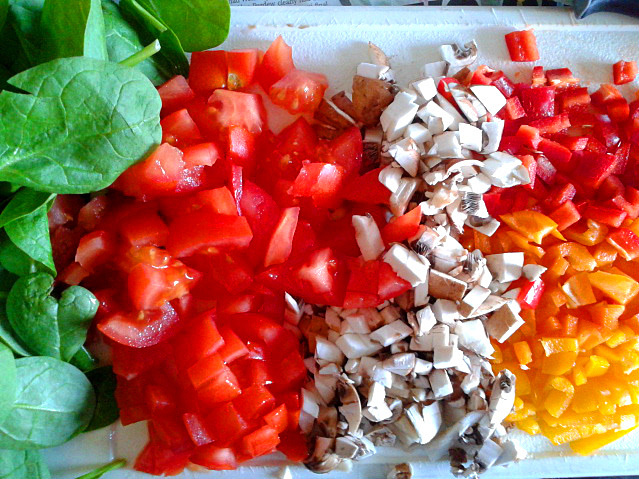 Chop your tomatoes, peppers and mushrooms. 6. In a frying pan, heat 2 tsp of Coconut Oil over medium heat and add your Garlic - finely chopped or crushed. 7. After about 2 minutes, once the garlic has browned a little, add in your Tomatoes, Peppers, Mushroom, Spinach, Kidney Beans, Black Eye Beans and Peas. 8. Cook for 5 minutes then lower the heat and mix in your Spices. 9. 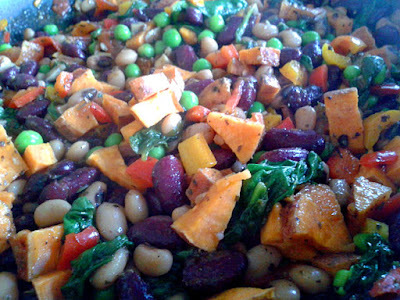 Cook for another 5 minutes then stir in your Sweet Potato, turn off the heat and cover. 10. Now back to the dough! Cut your dough into 4 equal chunk and roll them out on a floured surface. 11. 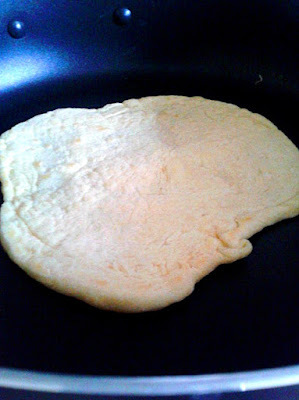 Heat a skillet pan over medium heat and place a tortilla in it. Cook for about 2-3 minutes on either side. 12. Spoon the filling down the middle of each tortilla, carefully roll them up and place them side by side in a baking tray.